Coeclerici Logistics, the logistics division of Coeclerici Group, is one of the world’s leading bulk material transshipment companies with a history of more than 40 years in this specific field. The year 2015 will mark an important goal for the whole Coeclerici Group which will celebrate its 120th anniversary — over a century of success in various business industries, from trading to shipping, from mining to logistics. Even during this tough period for the dry bulk commodities market, Coeclerici has been able to keep its position in the transshipment industry, ensuring a first-class service and reliable performances for its clients, continuously improving its technical and commercial expertise. Coeclerici has reported on an interesting update to one of its Floating Transfer Stations fleet which operates in East Kalimantan, Indonesia. The loading system on the Bulk Celebes has been improved with additional equipment that allows it to perform blending operations. This means it is now possible to mix homogeneously two different grades of coal. The blending percentage can vary from 20:80% to 50:50%. Once the desired percentage is set, the blend is monitored and automatically adjusted by the PLC unit which can vary the speed and flow rate of the belt extractors. Flow rate is controlled by three belt scales installed on the conveyor system, one on each extractor belt measuring each grade flow rate and on the transversal conveyor measuring the total flow. The homogeneous blending of coal is also enhanced by the transfer points of the conveyor system and the revamped system is able to guarantee reliable loading rate from 1,500tph (tonnes per hour) up to 2,000tph. In addition, a sampling unit is installed on the transversal conveyor system: this unit automatically grabs and packs a sample of the material from the conveyor belt in order to check the blended cargo whenever required. Operations are now running smoothly. Coeclerici’s clients have also confirmed the high quality of the blended product. In fact, blending is becoming more and more important from a strategic point of view. It is highly requested from the main players of the Indonesian coal market, giving to them a price advantage due to the possibility to offer a product more suitable to the final users. 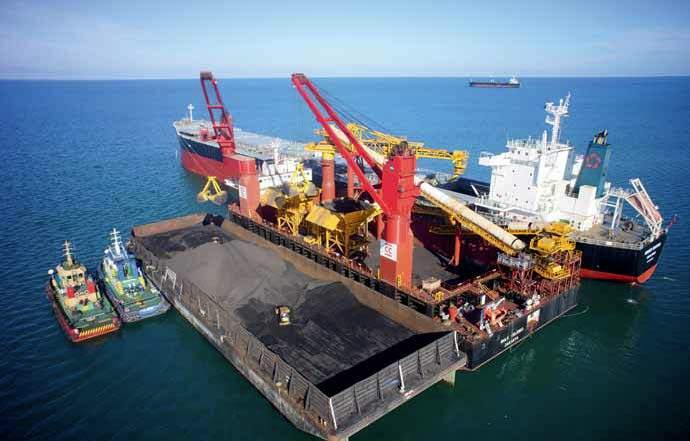 Furthermore, Indonesia is confirmed to be the one of the most important countries for Coeclerici’s logistics business, where five Floating Transfer Stations are working in the Kalimantan area, receiving coal from barges and loading OGVs (ocean-going vessels) with best net loading rates over 50,000 metric tonnes a day. In the course of 2014, between them they handled over 17 million tonnes of coal. The aim of Coeclerici for the near future is to strengthen its position in the transshipment market continuously creating innovative solution, engineering and promoting the use of ‘floating terminals’ throughout the world designing and developing different types of floating transshipment stations capable of lighterage /top-off operations, cargo transfer and self-unloading of many different dry bulk materials. These carry out all the same functions as a port terminal but with far smaller investments, lower management costs and less environmental impact. the new generation of self-unloader is equipped with advanced dust suppression systems. Dust suppression units are situated throughout the cargo handling areas, and the discharge booms are enclosed and fitted with water sprayers to further reduce dust during offloading.